I'm in a musing sort of mode today, musing over something which has been flitting through my mind for a few months now, namely a plan, so far unformed, to have a sideline enterprise related to gardening. Julie (as a professional gardener) and I have many discussions over this looking ahead to 2011 when I finish my stint on Saving Species. I have in effect a career blank canvass in front of me, so now is the time to make a few preliminary doodles. My idea is something along the lines of gardening for emotions, but so far a unique idea hasn't formulated itself, as many other people also are doing something similar to this. I know there is something there I'm looking at but un-observing. Time will tell me what this is. 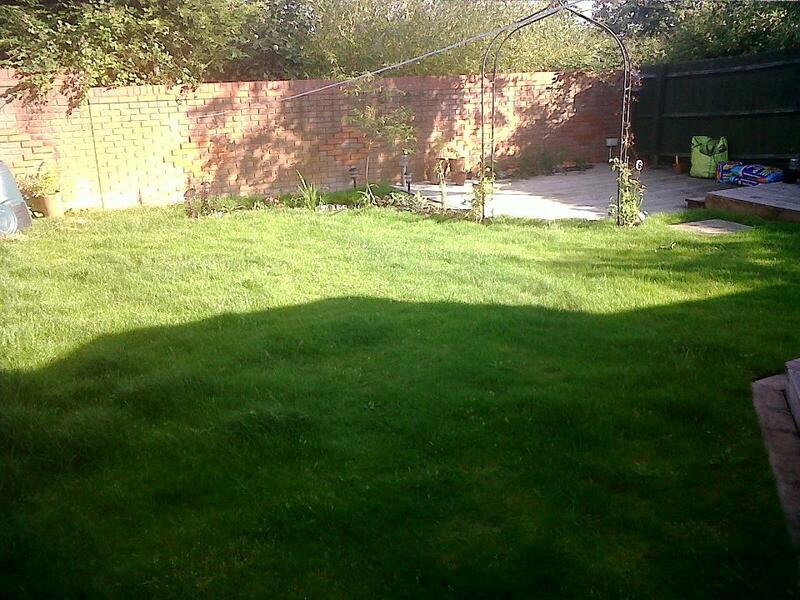 However today I thought where better to shape and form an enterprise than on the blank canvass of my own back garden. All my life gardening has been present in some form or another. 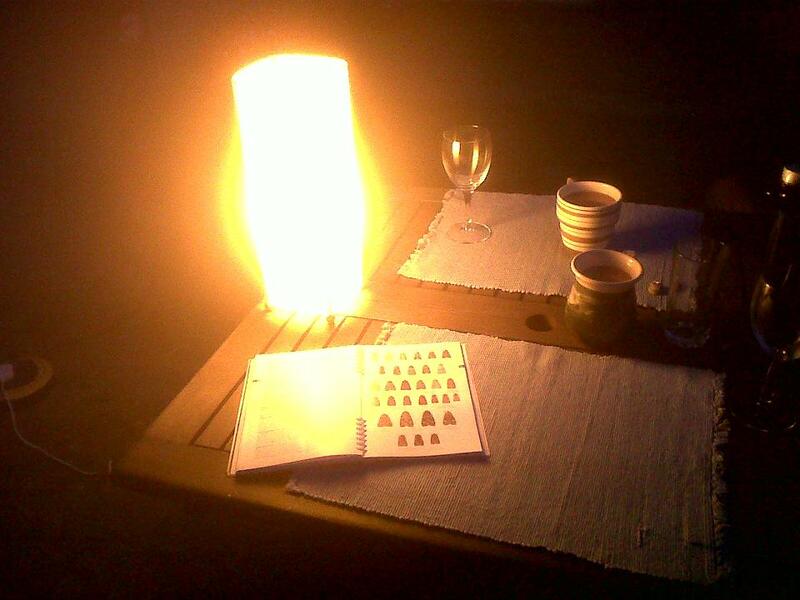 Last night we were kindly invited to a BBQ by a producer on Saving Species for an end of current run celebration. I've known this producer for many years but have not visited their wonderful wildlife friendly home before. The path up to the front door sets the scene exactly for what the rest of the garden is like. Exotically stuffed with flowers to attract as many insects and other wildlife as possible. Everywhere are bug boxes and tubes. On the water barrel, some bug boxes were temporarily left there before finding a home for them, and these unsecured domiciles can not now be moved as they are occupied by leaf-cutter bees happily stuffing leaves into the tubes. In the middle of the above photo is a sign, warning visitors of a subterranean wasps nest by the door. 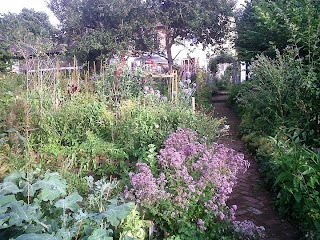 Equally the back garden is just a myriad of pleasure, vegetables mixed in with shrubs and wild flowers, and so on an evening like last night the humm and buzz of wildlife made the heart beat just that little bit quicker as the sun danced amongst the foliage. 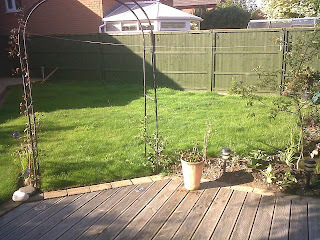 Returning home I looked at my own uncluttered and wildlife impoverished back garden. I've only been in this house since December 2009 and due to work commitments haven't really had a chance to do anything meaningful to change the layout. When I bought the house it had no borders or shrubs, being laid out as only lawn and decking, with a single silver birch along one edge. This suited the young family who lived here as they didn't have time, or interest to garden. It was an extension of their house for parties inclusive of 40 electric lights and a hot tub. Very easy to maintain, but not my style at all. 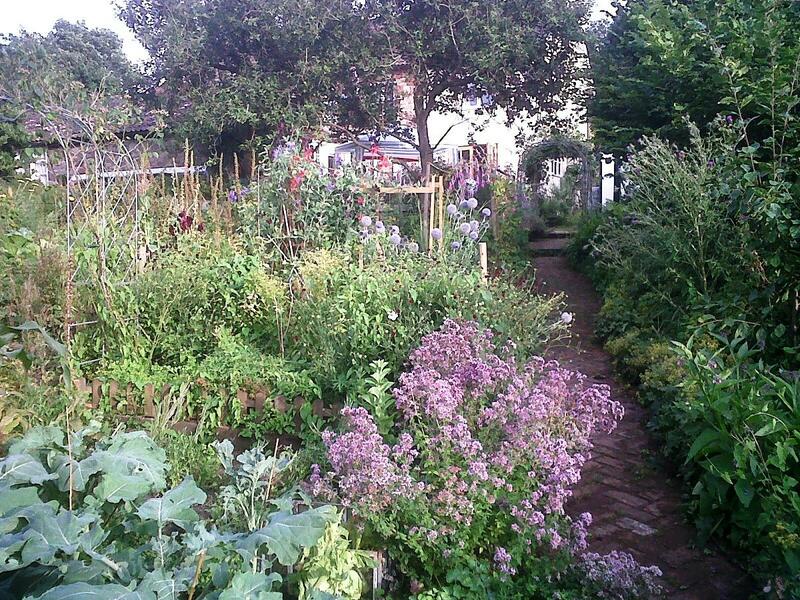 In the spring I did have time to dig a small border, with a tiny pond and erected an archway, but that is about all. 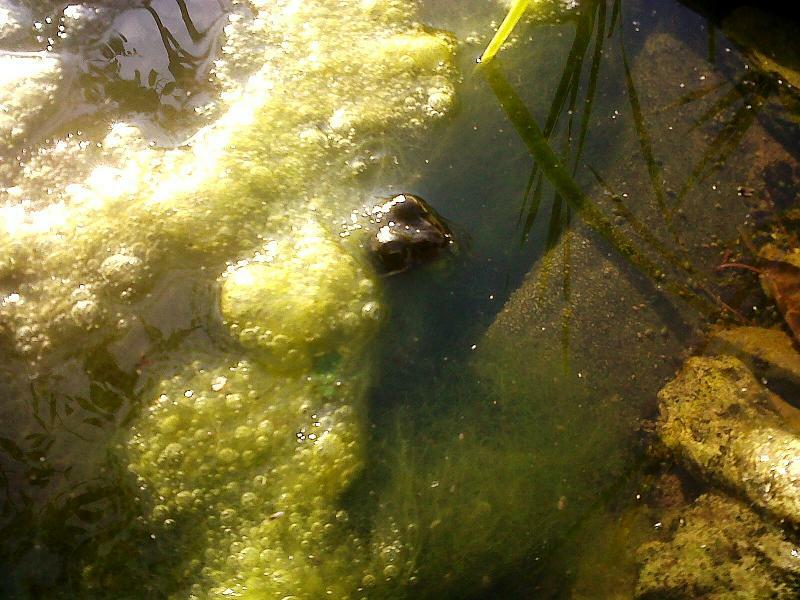 The pond may be small but already a friendly frog has taken up residence, proving that even a tiny amount of water will bring wildlife in. I've also noticed diving beetles in there, and blanket weed from somewhere. 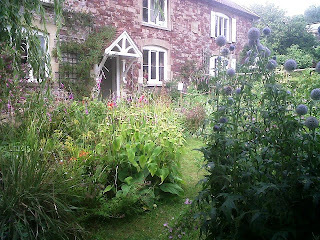 However this morning I spent a bit of time in the garden wandering about and wondering. In the 7 months I've been here I've not really had a chance to work out a plan. I think because there is so much decking, I can't see the wood for the trees, literally. My instinct is to dig it up as it is laid on gravel. But for the moment the decking does provide an easy to maintain hard area to sit on. While having a cup of tea and wandering about, because of recent heavy rain, the lawn has emerged emerald green and is growing at an alarming rate. It needs cutting. So I had a thought. Instead of cutting the entire lawn tonight, I will shape beds into the lawn by mowing only part of it, therefore letting some of the grass grow longer. It's too late in the year to produce a wildflower meadow this season, but if I use the lawn as a blank canvass to draw (mow) on, I can amend the design at will before making bigger commitments (and mistakes). I also have problems with creating a wildflower meadow as this is heavy clay soil. But a good rummage through the Bright Seeds website has given me hope and inspiration. So that's my plan, such as it is. I'd also like to get movement into the garden, and sound. As such I'm also wondering if I can construct an aeolian wind harp. Nothing as elaborate as those on this website here, but I did read an article about Mohican Wind Harps which interested me. Sand Bay my local piece of coastline has many huge pieces of driftwood brought in..... are there the bones for a wind harp to be found out there I wonder? And so it begins. I've no timeline or plan, but any results will be sure to waft through to the blog. 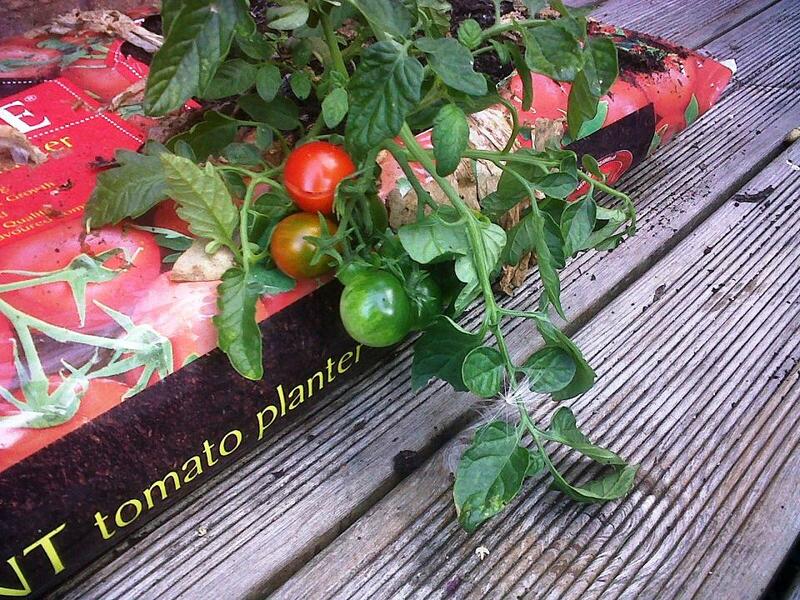 In the meantime I shall marvel at the ripe tomato from my much neglected outdoor plants. I bought the grow-bags and plants a month ago then didn't have time to stake them, so they're sprawling over the decking. But they are turning red! And finally this website also interested me over the weekend..... after all we all have a need to sit back and enjoy the garden too...... now where is that bottle of wine? I must do more thinking !! What is it about weekends? Friday evening promises much and within a gnats crotchet of time I'm driving back down the M4 from Wiltshire on a Monday morning to begin another week at work. After a day at the coal face that is Wildlife Broadcasting in Bristol I arrived at my weekend retreat in Wiltshire ready for an experiment. Following a shower and fresh clean clothing we ventured out into the garden for sustenance and clutching a fortifying bottle of alcoholic grape juice. My plan over the weekend was to build and have a play with a home made moth trap (being far too mean to buy a proper one). I am absolutely hopeless with moths and as many bloggers and friends are now becoming expert, I feel I should improve my knowledge. However on Friday night; possibly something to do with the inbibement of pino grigio, a mellow thought wafted over me. 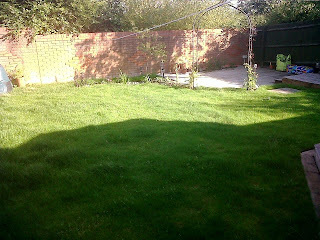 I wonder what will happen if I just place a bright light outside, given the garden is surrounded by fields? Moths will fly in in their hundreds and I can sit there identifying them to my hearts content. Well I have to say it was a dismal failure. Over an hour a handful of micro - moths aimlessly flew by and then we went to bed, with a plan to build a proper device on Saturday. Which Saturday I'm not saying, needless to say though, it's a plan unburdened by activity so far. Julie had a noon appointment in Berkshire on Saturday, so we planned to have a leisurely start and then quickly pop to one of her gardens for me to help her with a bit of tying up then on for a coffee, perusal of antique shops and the afternoon stretching before us. At the garden in question we were met a terrifying guard dog of gargantuan proportions. He's a terrier puppy, full of life and bounded across the lawns to play with us. A peaceful morning it was not, as he has the energy and enthusiasm only puppy's have. He just never stopped. He's lovely though. 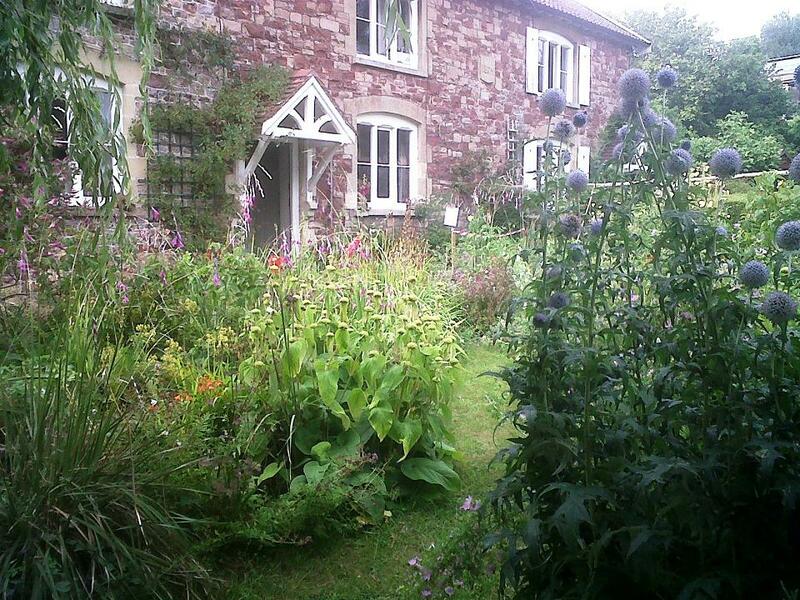 The garden however is huge and includes fields and a wildlife area. This made up for the mothing fiasco the evening before. Julie left me to check on the greenhouses and I wandered through a wealth of wildflowers awash with butterflies. Sadly I don't have a good macro camera at the moment for photos, but the following were in abundance. Common blue, and 2 Adonis Blue, Brimstone, Large and Small White, Gatekeeper, Ringlet, Peacock and Small Tortoiseshell. Hundreds of hover flies and bees buzzed about and grasshoppers churred everywhere. I'd love to go there and spend the day identifying them. All too soon though we headed to town. After a coffee, Julie went for her appointment and I strolled through the myriad of antique shops the town had to offer. There I spied in one of the book shops Highways and Byways in Dorset by Sir Frederick Treves (1853 to 1923) who I've since found out was also the author of the Elephant Man. This was a second edition, 1935, in reasonable condition for £8. 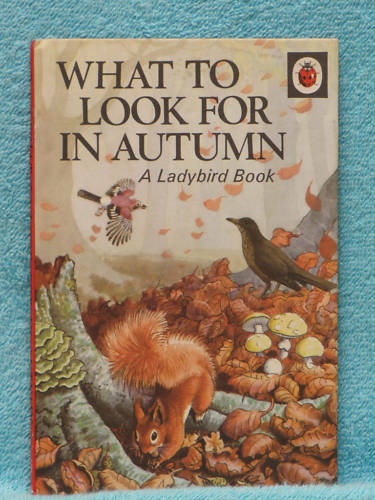 Julie had joined me by this time and she found for herself a Ladybird Book "What to look for in Autumn" book, which reminded her of her childhood, so that was purchased along with the Dorset guide and we left Hungerford a happy couple. I was especially happy as Julie bought me the Dorset book. A nice surprise. We hadn't eaten so found ourselves by a method only we appreciate in a wonderful Organic Farm Shop just outside Cirencester called strangely enough The Organic Farm Shop. I've not been here before, but I'd recommend it for the food and the feel of a real organic farm shop and not somewhere selling organic products. Fed and watered we wound our way home via the Wooton Basset area, so we were back in Wiltshire. Julie has a client here called Barbara, more of a friend really. So on the spur of the moment we popped in, and after tea and cakes, I cut her large lawn and we left. Barbara is a wealth of knowledge and has a very sprightly mind for a 91 year old. We love talking to her and her past as she has lived all over the world and still has a mind which is looking forward. I hope I am like that in my dotage. Positive and fun to be with. I'm also hoping as she has a huge wasps nest being built in a clematis that when the wasps leave later in the year, I can detach the nest and photograph it for the blog. Wasps are natures good guys with a bad press and their nests are absolutely stunning inside with their airflow regulation chambers. Sunday - oh dear, it was all going so well too !! A quiet day in the garden. Julie asked me if I'd sharpen her tools so as I sat there she suggested I needed some protection on my head from the sun. The resulting photograph is slightly disturbing. I can only apologise. All in all a very relaxing weekend...... that photograph does worry me......... !!!! After having so many weeks of dry weather this year, I am enjoying the more turbulent aspect of our atmosphere at the moment. 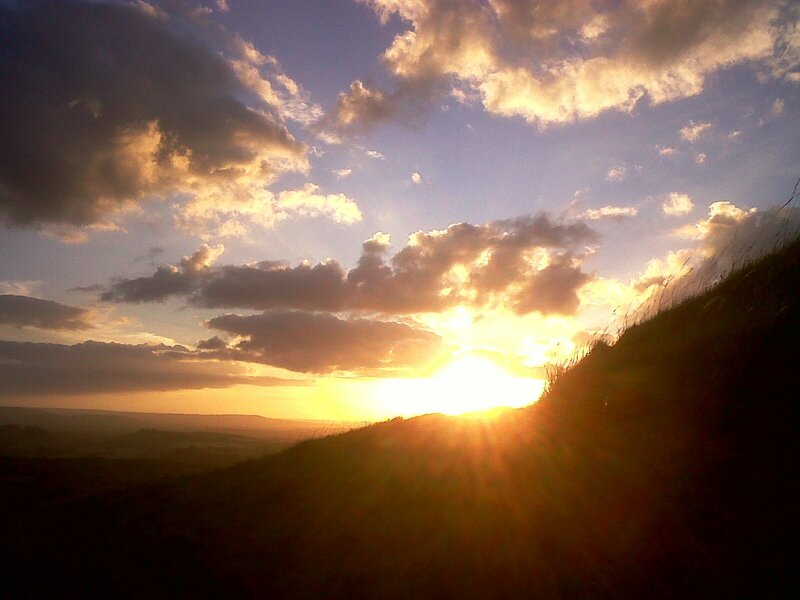 Just last week whilst the temperature remained warm, cooling gales caressed the land for days on end. Warm humid air travelling over the British Isles from the Atlantic brought welcome respite to the suffocating heat of the preceding months. I'm not a fan of lazy hazy days of summer, when the air is still and a stupefied atmosphere comes over me. Don't get me wrong. I love the long hours of sunlight, being able to sit out of an evening and watch bats in the sunset; but to feel of a breeze on my face as I walk excites me. I long for rain, and that special cooling effect summer rain brings to a parched landscape. And that unique scent of dry earth being rewetted, there's nothing like it. And so today's changeable weather is exciting for me. This morning looking out over the fields from home, all was calm and summery. Blue skies and white cotton wool Cumulous clouds. But I know, we all know, these are clouds forming because of rising air, rising as the sun heats the land and then cooling with altitude, allowing water vapour contained within the rising air to condense. Given sufficient moisture and energy in the sky Cumulonimbus may form, and that's what happened today. Cumulonimbus the rain-bearing cloud can be considered as a bigger, better organised version of the cumulus cloud, though one does not always lead to the other. As Cumulonimbus form they feed more and more on the updraft of energy from the land, often growing rapidly, sometimes in less than 30 minutes until in most cases they lead to rain, often torrential but short lived. Or more excitingly, a thunderstorm as we had today. The above photograph was taken from just outside my office at about 4.30pm this afternoon. I'd gone outside as a mass of herring gulls were circling around a rising column of flying ants. Were the herring gulls feeding on the ants? Or were they just rising with the updraft of warm air the flying ants were trapped in? I'm unsure, but the air felt warm and humid and a breeze picked up while I stood there talking to a friend. Then we felt the first raindrop. Big and wet, a single spat on the ground. In seconds, it was as if the taps of heaven had been opened and lightning flashed about us, followed milli-seconds later by the crash of thunder. Most apt given it is Thursday, or Thor's day. Since a child and discovering my Scandinavian ancestry, I have been interested in Norse mythology, and Thor in particular, the God of sky, thunder and fertility. Although various incarnations of Thor exist, most refer to Thor as being associated with law and order in Asgard (Norse World in Mythology) and guardian of the gods. He was the son of Odin and Fjorgyn, the earth goddess and husband of Sif. Also known as the "thunder god" and "charioteer". During a thunderstorm, Thor would ride through the heavens on his great chariot, pulled by two magical goats. Whenever he swung Mjolnir (a magical hammer), lightning flashed across the sky. Was Thor up there today? 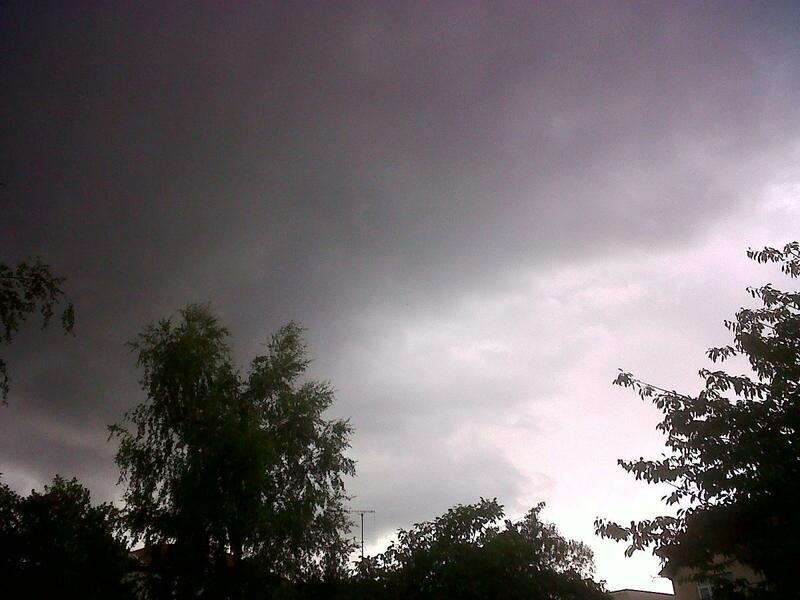 I like to think so, because I find Thunderstorms are absolutely energising. 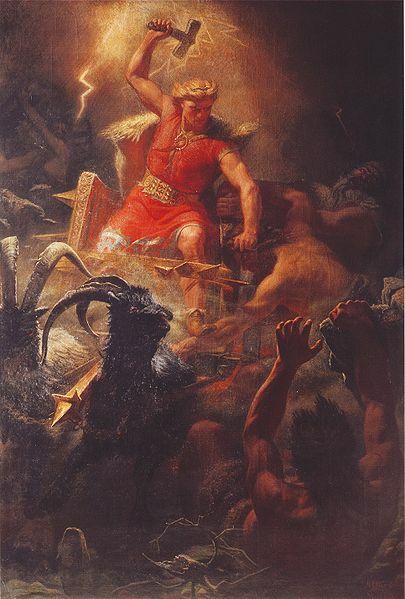 Thor's Battle Against the Giants (1872) by Mårten Eskil Winge. Some of you who will read this will remember the other blogs I have had over the years since I began blogging in 2007. (Many of you will still be under strict medical supervision as you recover from that experience). However over time things have changed, I have changed and so have my interests. I've also changed what I wish to write about and put onto a blog. My original blog began purely a wildlife diary, just chronicling what I saw. Then there was an arts and craft blog which I occasionally used to outline the trials and tribulations of my artistic doodlings. Latterly I began a blog exploring the wider countryside, but that didn't seem to work either, not least because work commitments kept getting in the way. Interestingly I'd never created a blog for my writing, poetry and self expression, something I have let lapse recently and plan to resurrect when time allows. Which neatly brings me full circle to this new blog, "Tales of the Wessex Reiver". What do I want this blog to be? What is it I'm trying to say? 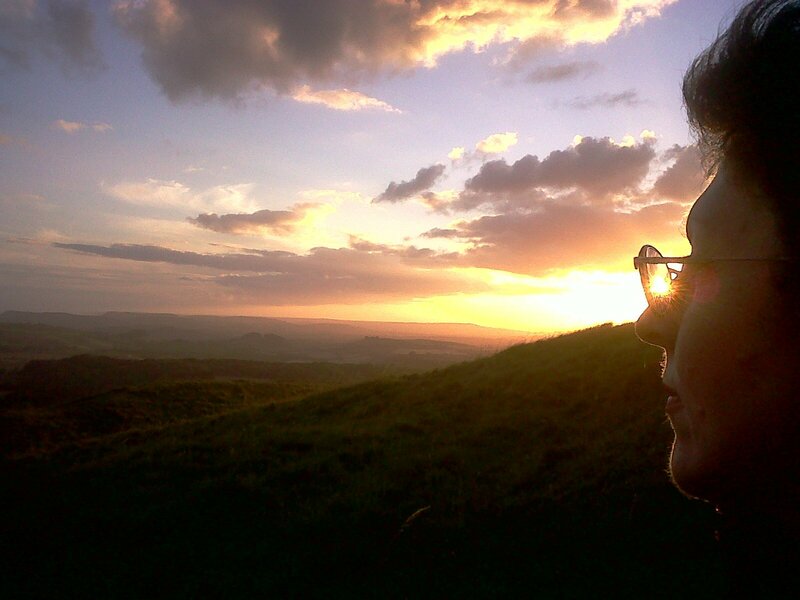 Blogging is inherently egotistical, which is no bad thing in itself. We as authors write our regular updates and hope others read and absorb our thoughts and words. For me blogging does a whole lot more than say texting, Facebook or Twittering as it allows exploration of a concept albeit in a concise way. I blog therefore I am. So by design, I have no theme for this blog other than whatever interests me at a given point in time; although it will be heavily weighted towards rural Wessex (Cornwall, Devon, Dorset, Gloucestershire, Somerset and Wiltshire). Counties where I spend the bulk of my idling moments as my middle aged years gallop alongside me. My ambition, for what it's worth, is that over time I can create a personal account of what interests me, maybe even interest you, the reader. If it does, please leave me a comment as I love to know what you out there think of my musings. Something for me to look back on over the years and think..... I was there!! So what is a Wessex Reiver? Well for nearly 10 minutes I thought long and hard over a cup of tea and digestive biccy about the title for this blog. What did I want to say about the blog and it's content from its title? Initially "A Child Alone" was a front runner, partly as I am an only child myself, but also as the title of a favourite autobiography of mine about the writer BB (Denys Watkins-Pitchford 1905-1990). But something told me that wasn't right. Using somebody elses words doesn't come easily to me. And then it came to me as the digestive detached itself from the main body and plopped into the tea, I'm from "up't north" where the Border Reivers come from and have lived in Wessex since 1993. Could I combine the two? I text'd my idea for a title (The Wessex Reiver) to my soul mate, editor and partner Julie. She immediately text'd back saying she liked it, but suggested a slight change "Tales of a Wessex Reiver". And that was a perfect title as it conveyed what I was trying to put across in a title, but failing to come up with myself. Last week I was on a weeks holiday. And I had big plans to write a blog a few times during the week. But as ever, time flew by, it was too hot to think. So the best laid plans of mice and men fell by the wayside and as such as a belated update, a quick update from a wonderful day at Mere Down Falconry last week. Back in March as both Julie and I have birthdays 4 days apart I bought as a joint birthday present a full day flying experience with Mere Down Falconry, near Mere on the Wiltshire and Dorset border. And we picked a fabulous Tuesday to do this as as this is a one man band operation only Julie and I were there with Alan Gates the falconer. What a day. Arriving in hot sunny weather at only 10am we wondered what the day would be like, but needn't have worried. After coffee and a chat Alan showed us his collection of birds ranging in size from a Golden Eagle to a Little Owl. We were particularly taken with Peace a Barn Owl which had such a gentle manner we flew and fed it ourselves. And Bramble above, the sleepiest Tawny Owl I've even seen. Flying for Bramble was a chore but he managed it, a couple of times. Alan also brought out the falcons and flew them from the lure, having a falcon zip past one's head at break neck speed was a glorious feeling. But after 3 hours or so we'd fed and watered all but two of the birds, Molly and Bond, related Harris Hawks. That was for the afternoon. And what an afternoon. If you ever want to feel like someone in tune with a wild animal and be part of that animal's environment, I'd recommend you go for a 3 hour walk through countryside with two free flying Harris Hawks. The sensation of walking, the birds flying past, over, alongside and behind us and the glorious countryside, it was an experience I will never forget. I loved the fact too that the birds would come onto the gauntlet and sit there while we walked along. It really is something to have a killer on one's arm and only 6 inches away. Above, Julie with Molly when we stopped for a rest. Molly sat on Julie's arm for ages. Whereas Bond below decided my shoes needed a good seeing to. The final picture just says it all for me. I lay back on the grass, Bond sat on my leg and watch the world go by. It was hot, it was sunny, and I was at peace with the world with my bird for the day. Yes these may be imprinted birds, but they're still wild enough to fly free and enjoy a good life. An absolutely fantastic way to spend a day, just the two of us with Alan the falconer and some stunning birds of prey. I'm absolutely hooked.